IBM Model M keyboards are famous for their feel, sound, and aesthetic. Some of that renown stems from their widespread production and availability, even in the aftermarket, but the majority of their reputation was earned with solid typing performance. Four companies implemented the IBM Membrane Buckling Spring: IBM, Lexmark, AT&T, and Unicomp. IBM designed the switch and created its original tooling. Lexmark then licensed the technology and purchased some production equipment from IBM. 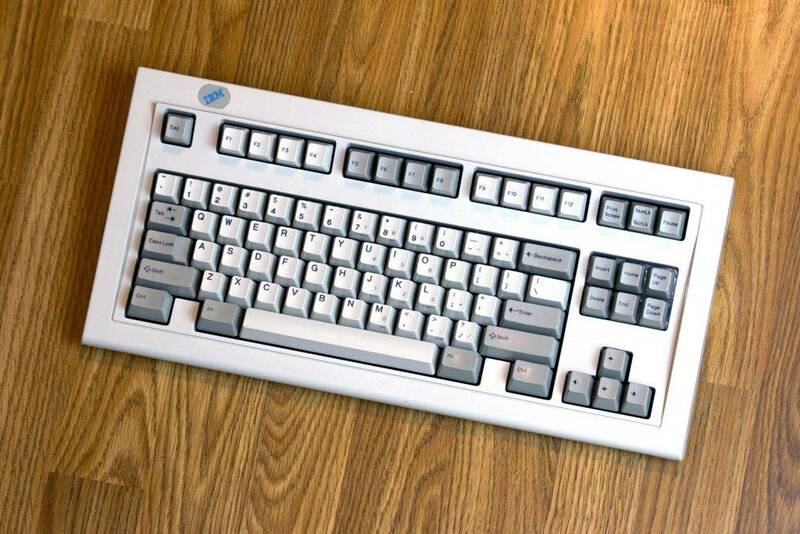 AT&T also produced IBM Buckling Spring keyboards for a short time in the 90s. The Lexmark tooling was purchased by Unicomp, which still manufactures Buckling Spring keyboards. Different model years and manufacturers led to varying spring weights and sounds, but the core press feel is consistent. The remarkable and implosive tactile event caused by the collapse or “buckle” of a long spring is the hallmark of all IBM buckling spring switches. Presses are generally smooth, heavy, and metallic in feel. Spring vibrations can be transmitted to one’s fingertips at several points during a keystroke. Membrane layers and a protective rubber sheet add a plastic element to the switches’ sound and feel. If you have clicked the cylindrical button at the top of a retractable ballpoint pen, you have likely experienced something like a Membrane Buckling Spring switch. The mechanism isn’t quite the same, but the sensation is reasonably similar. IBM Membrane Buckling Spring switches have a unique sound. They are loud. Rapid typing amplifies the effect, which can make others all too aware of your keystrokes. A press has a number of different noise generating actions, including upstroke and downstroke clack. The loudest contributor is the spring itself. A satisfying “tack” noise results from the spring’s buckling snap. In addition, its harmonics and vibrations are unmistakable. Rapid typing causes unpressed springs to resonate at various frequencies. The resonance results in atonal “singing,” which is a divisive sound in many environments. Some modifications can directly improve the switches. Floss or grease can be used to quiet down noisy springs. PTFE dry lubricant further reduces switch friction. Such modifications can make a Membrane Buckling Spring keyboard feel better than stock, though missing rivets and other issues with the overall condition of the keyboard may offset improvements unless further refurbishment occurs. 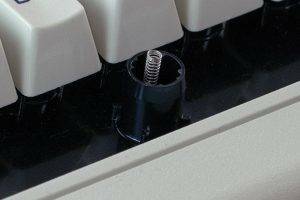 Most enthusiasts consider Model M switches less enjoyable than Model F switches, which use a capacitive mechanism, but they are the most accessible buckling spring. 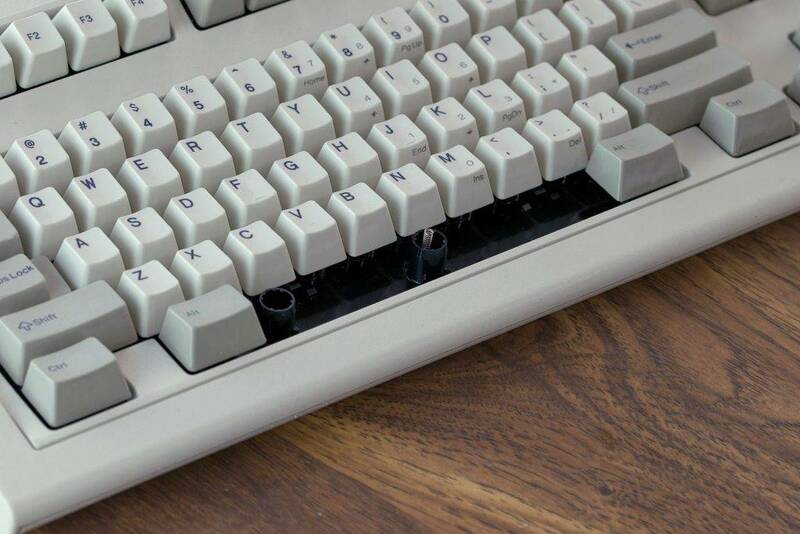 Every keyboard aficionado should sample or own the mechanism that defined clicky switches for a generation of computer users.